Me likee. Could use a front bumper tuck and some sport mirrors, though. Agreed. I want to do one of these if anyone has one they would like a rendering of. That's a good looking car! That's going to be a steal for somebody if the price stalls near where it's at. That is a Regal I can see in my driveway. Man that's a nice one. Always liked the 73-75 style over the 76 & 77. 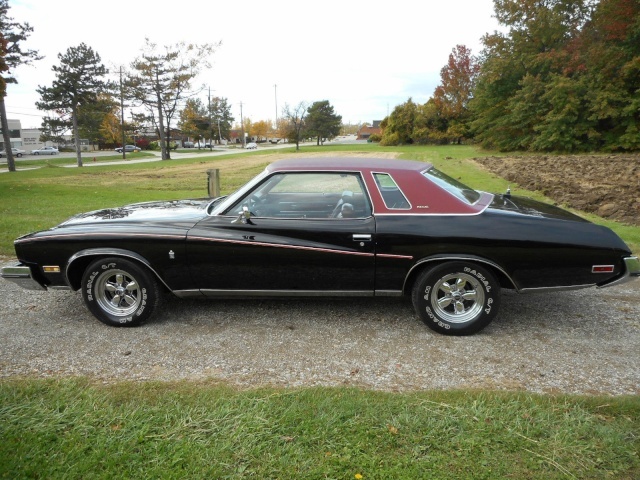 I don't get why they ever changed from the Monte to the Cutlass platform. That's located like five miles from me. It does look nice though. So, John...if I bid and win, you'd be able to go pick it up and keep it nice and dry in your garage over the winter for me? Lol! "Lastly, the title reads 123K miles, exceeded mechanical limits. This is the way we got it, and this is how we’re selling it. We invite all interested bidders to come out and see it in person." That'll never fly here in MA. You need an affidavit from the owner explaining why that box was checked on the title. Maybe that's why it's stalled. People are kinda dumb sometimes and check that box. When one of those old odometers rolls over past 99,999 it doesn't mean that it "exceeds" you just have to start over keeping track of the mileage. Folks make that mistake all the time because they don't deal with titles often enough. When (Lord willing!) I go to register Mali, I'll have to go to the inspection station w/ the title miles, 134k. My new speed-o says like 26,000 on it so every year when I get it inspected I'll have to "explain" this. So I've gone to the extreme of having a notarized document that explains it, with photo's of the original equipment and copy of the NH Title which it was sold to me on. Just noticed it has the factory AM/FM/8-track player. Also noticed there is some bubbling under the vinyl top. Sorry for replying to and old thread, but I plan to go regal hunting next year, and being from Canada unfamiliar with U.S. titles. What does "exceeds mechanical limits" actually mean? How can a car exceed mechanical limits? What other things should I be on the look out for when trying to buy a car from the U.S.? If the odometer resets to zero after 100,000 miles, it had "exceeded mechanical limits"
That phrase is often an incorrect "check mark" when the title is transferred. In my state (MA) it should never be checked off and if it is it often brings problems to the new owner when going to register the car again. If the odometer has turned over the mileage stated on the title should reflect, for example 130,000. Do not buy a car that reads "Mechanical limits exceeded", "Salvage" or "Repaired" on it's title. You're only asking for trouble. 'Mechanical limits exceeded' will be listed on the title of any pre-1990 vehicle with a five digit odometer. Some states list it as mileage exempt. So I guess you are correct, all old cars are trouble. In NY 1972 and older just gets a transferable registration. No title but make sure it says transferable on it or the guy selling is going to have to get it taken care of.